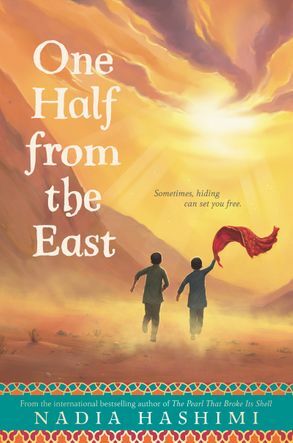 Perfect for fans of Rita Williams-Garcia, Thanhha Lai, and Rebecca Stead, internationally bestselling author Nadia Hashimi’s first novel for young readers is a coming-of-age journey set in modern-day Afghanistan that explores life as a bacha posh—a preteen girl dressed as a boy. Obayda’s family is in need of some good fortune, and her aunt has an idea to bring the family luck—dress Obayda, the youngest of four sisters, as a boy, a bacha posh. Life in this in-between place is confusing, but once Obayda meets another bacha posh, everything changes. Their transformation won’t last forever, though—unless the two best friends can figure out a way to make it stick and make their newfound freedoms endure. Nadia Hashimi’s first novel for adults, The Pearl That Broke Its Shell, was a bestseller that shares a bacha posh character with One Half from the East. Nadia Hashimi was born and raised in New York and New Jersey. Both her parents were born in Afghanistan and left in the early 1970s, before the Soviet invasion. Nadia is the author of three books for adults, as well as the middle grade novel One Half from the East. She is a pediatrician and lives with her family in the Washington, DC suburbs. Visit her online at www.nadiahashimi.com.